My impression of much of what we've seen in 2014 is that web mapping is maturing. Neo is not so neo any more. There are still plenty of ghastly mashups, nonsensical efforts and collections of '40 maps that will change your mind on something you never cared about anyway' but there's better quality too. While 2013 seemed to be the year when everyone was simply trying to out-score each other with different map styles, 2014 has seen less of that trend. Perhaps we're getting a little bored of the fact you can colour in your map a million different ways. Maybe we're moving a little away from the preoccupation with form (nice to look at) and beginning to see function reappear as a key reason for a map to be made. The trend of mapping data from social media does, however, seem to be continuing unabated. Most commentators agree that Twitter data, for instance, is just plain dreadful with so much error, bias and uncertainty as to make it practically useless for teasing out meaningful trends. I've yet to see a well made map of Twitter data though technologically we're seeing some impressive data processing efforts to get the data on the map. It's a start but finding more nuanced ways of revealing something useful needs to be the next step. Big data is still a buzzword but so often used inappropriately. As one of my colleagues said earlier in the year "if it fits on a portable drive it isn't big data so #$%* off". Maps are not exempt from the trend to simply map more and larger datasets and a key challenge is to re-think ways of representing millions of features on a map so as to make the map readable and to encode some message or meaning into the map. It's simply not good enough throwing a whole heap of data onto a map and expecting it to work, just because it's technically feasible to do so. Without cartography it's just a visual data dump even if you've coloured it in. That brings me onto cartography in general. We're still seeing a marginalisation of cartography and cartographers by the avant-garde, the so-called new mapmakers. They seem, generally, to be more comfortable and less combative in the mapping space than a year or so ago (maturity again) but recognising so much of what has gone before still seems to elude many and they're still fond of reinvention. On the other hand, it's also true that cartographers still fail in reaching out and explaining their craft more widely. We are experts in our art and science and have a duty to share that with a society hungry for maps and mapping but I still see far too many who just sit back and watch from the sidelines. How many blogs do you see from real, proper cartographers? Why do we still hide good quality cartographic research in academic journals? This latter point may seem somewhat ironic given I just stepped down from editing one such journal but I've become increasingly uncomfortable with the journal as a sole means of disseminating research. If you've got something to say - say it to the people who need to know; and they're likely not the ones reading that academic journal. That said it's been pleasing to see some recent changes to how news-related blog sites report on cartographic work. There's less of the hysterical reporting of some latest greatest map (that likely isn't) and some good reporting of real cartographic work. 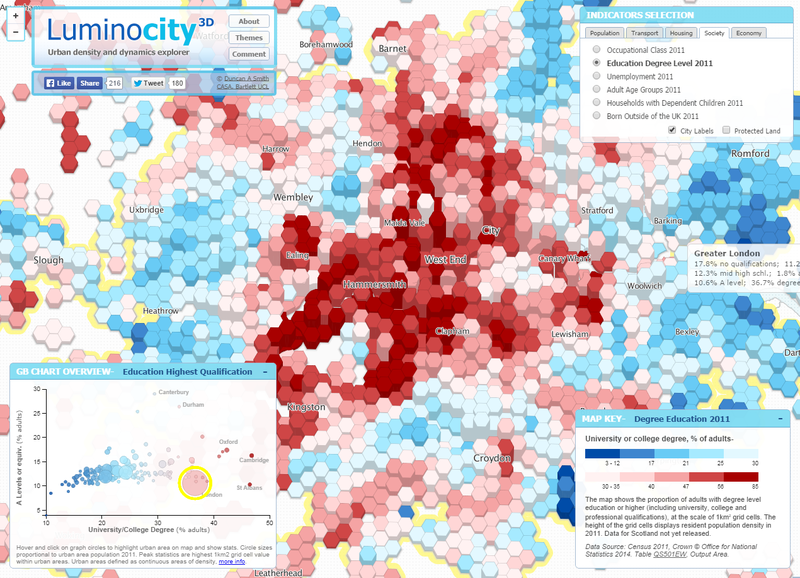 Citylab have been doing this well recently. 2015 should see more development in the 3D space with improvements in the way in which data can be visualized more easily and responsively in web browsers. This being the case, it's incumbent on us to properly harness the potential of 3D and not simply use it for the sake of using it. In the same way that I've yet to see a real use for Torque animations (flashing lights showing where people tweet being the biggest culprit...stop press, actually this use showing Alcatraz escapee survival chances begins to use it meaningfully) it's also true that 3D is often used for no good reason. If data is truly temporal and has important characteristics that a temporal depiction can show then design to show that. If there is value in delivering the data to make some additional and purposeful use of the third-dimension then great - but there's more pitfalls to mapping both the temporal and third dimensions that need to be assessed to make the map work. I'd also like 2015 to be a year in which cartography becomes just a little more recognised for its worth as a discipline and a profession. It seems we've been trying to get everyone to think and work like cartographers for years but I'm not convinced this is the right approach. They're all busy trying to be professionals in their own areas. It also seems that for this to work, it would require a very rigid rules-based approach to allow people to follow to get to the end map (literally mapping by numbers). While many cartographic rules (I prefer to call them guidelines) exist to lead people down the right path, experimentation is playing a big part in modern cartography. It always has if truth be told. Some of this is in the academic space; some in the hacking space; but both modes of design and production are useful. Cartography is a profession and cartographic professionals are knowledgeable and practiced. They have a lot to offer. I firmly believe collaboration is key and I've long said that there's an important distinction between a professional and an amateur in any discipline or profession. I don't use the word amateur in a derogatory sense either - it's used to differentiate someone who is not formally trained, educated or practiced in a particular realm. We're all professionals at something and we're all amateurs at far more besides. Recognising that and collaborating with professionals from another area is likely to yield results that are greater than the sum of the parts. It might also save you time and frustration! In a personal sense I made a frivolous map this year (the Proclaimers 500 miles nonsense) that got more hits to my blog (12,000) than virtually everything else I have ever done put together. It's possibly the worst piece of work I've ever done. It's not even a proper map. That's how frustrating and disappointing the internet can be. So with that mini-review/rant out of the way, let me run through a few of my favourite maps from 2014. I was politely waiting for others to post their own lists but I got bored waiting so thought I'd rustle up my choices. They're an eclectic set but as I've spent the year writing a daily blog on the ICA Map Design Commission blog it's been a relatively easy process to narrow down my favourites this year. The idea of telling stories with maps is not new. The re-emergence of this genre through the medium of the web with the compilation of related multimedia to create a narrative has been a big story itself in 2014. This effort in The Guardian's web site remains one of the best framed I've seen. Simple idea. Good content. Not over-produced. Ollie's been doing some great work with the London Bicycle hire data, particularly with some online mapping. 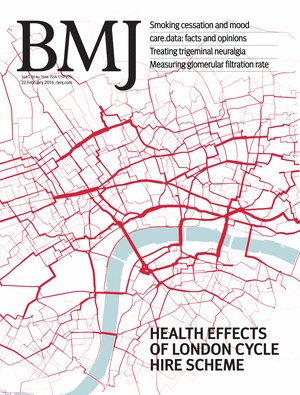 I really like this static representation which BMJ used the map as their cover art to highlight a paper that explored the health benefits of the bikeshare scheme compared to other forms of transport. It's a simple flow map but simple often works very well and the saturated red of the routes is a clear metaphor for a blood capillary network and resonates well as cover art. Ollie even chose to exclude all other detail except for the iconic River Thames in the style of Beck's underground map. 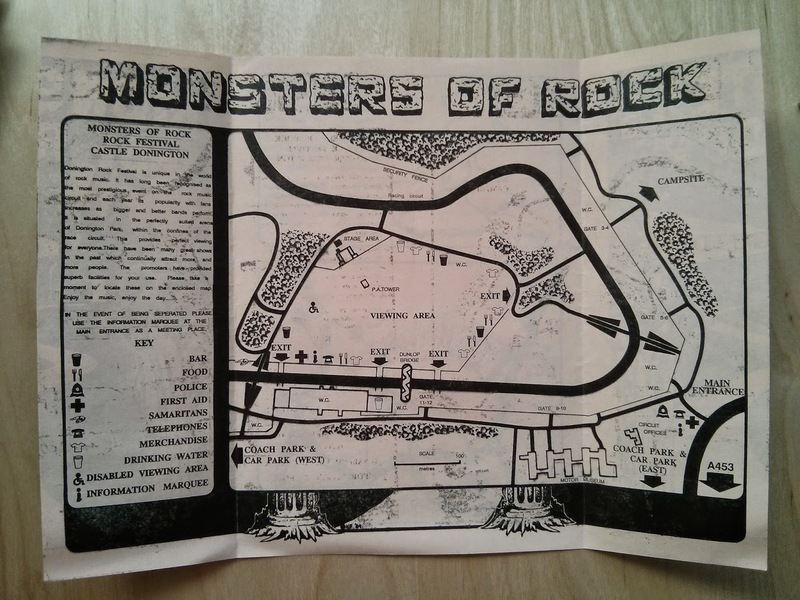 A black and white, printed map. 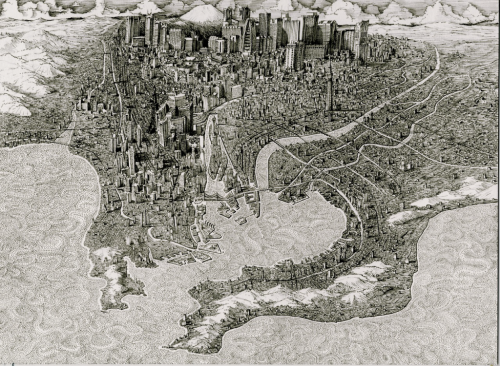 There's still space in a list like this for a terrific perspective drawing of Tokyo that when viewed close-up shows incredible detail. 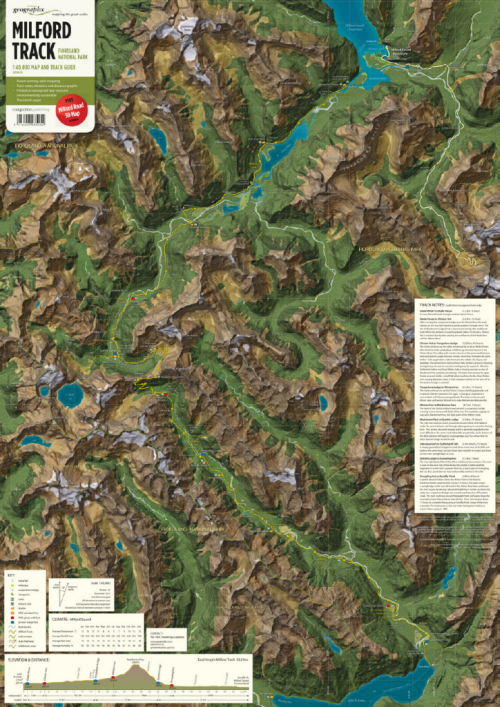 No fancy web controls here...just beautiful cartography that builds off a fine legacy of illustrative bird's eye views. A simple concept that does manage to use animation to good effect to show how New York City's population structure changes over a 24 hour period. 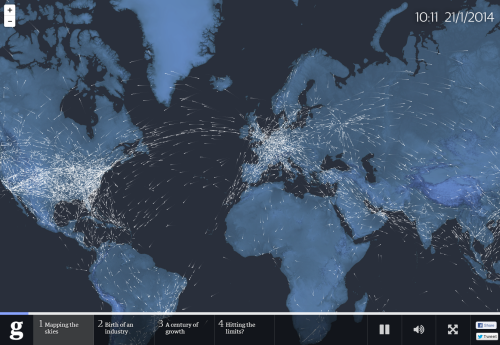 There's a lot of data in here but it's represented with clarity and the animation brings to life the ebb and flow. the moving graph helps to contextualize the work. Mapping cities at the same scale is important to support the cognitive process of visual comparison. It's as simple as using the right projection...or using small multiples and mapping the same phenomena at the same scale. I like the way small multiples supports the process of visual comparison in this map. 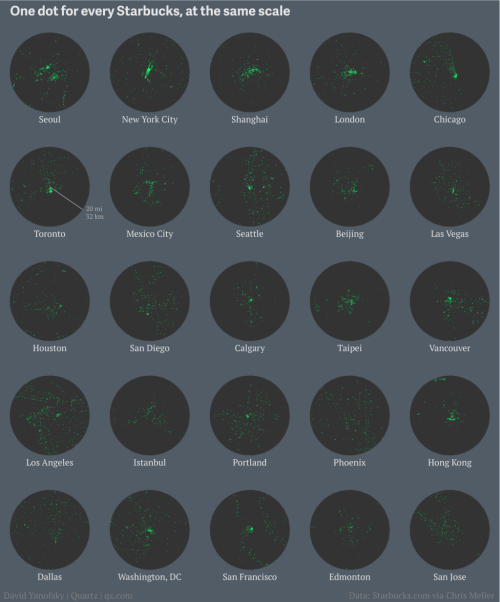 It helps that there are so many Starbucks outlets that the structure of each city is well defined. A large dataset brought to life by focusing on a single entity at a time. 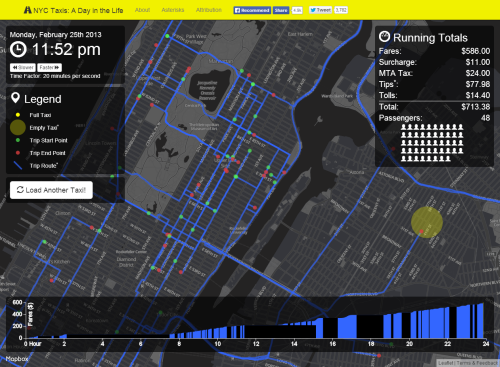 This moving map takes you on a journey of a single New York City taxi cab. It shows a range of useful information including fares and a timeline. 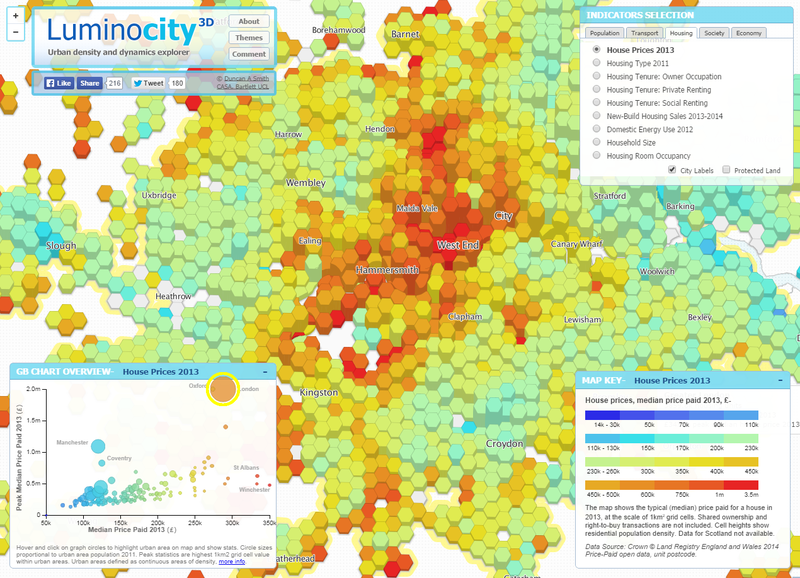 A lovely piece of work that works well, marries form and function and shows us what web mapping can be. Stephen based his modern version of the U.S. on a mid-century map of the United Kingdom. He did so with a keen eye and shows that modern maps don't have to constantly reinvent to be eye-catching and purposeful. He perfected a beautiful aesthetic and gave life to his data. You can't beat a bit of satire in cartography and the shapes of maps gives artists a perfect canvas upon which to create something new and provocative. 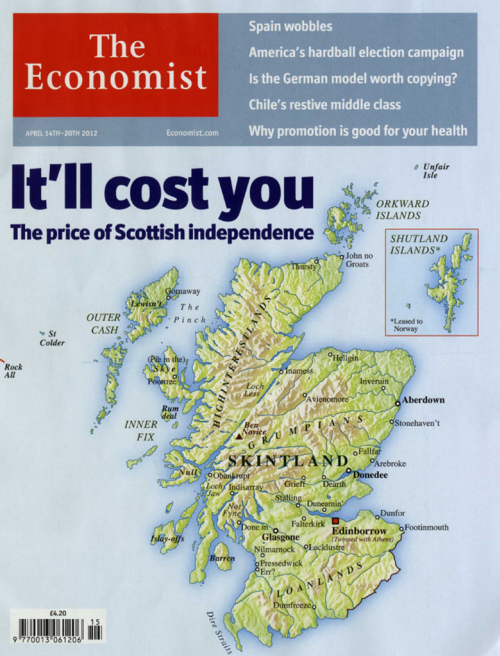 The Scottish vote for independence was too good an opportunity to miss and The Economist did a great job in creating this satirical map for their front cover. Pseudo-natural looking depiction supports this map's primary function for wayfinding. It's a map for walkers. The fact it's printed on rock (yes, rock!) makes it practically indestructable as well. The hill-shading and deep, rich colours gives this map a somewhat unique visual appeal but different is good in this case. Fine, detailed contour lines and expertly designed and positioned typographic elements makes it work well as well as looking great. Tom Patterson's beautiful cartography once again shines in this exquisite depiction of the terrain morphology and colours of the landscape. Realistic rendering of the terrain captures not only the vertical component but also something of the horizontal structure and bedding to give an impression of rock texturing synonymous of historic, manually drawn relief and rock shading. There's a lot going on in the creation of this map but the devil is in the detail and it's the detail that makes this so easy on the eye. Not a map...but a book of maps. 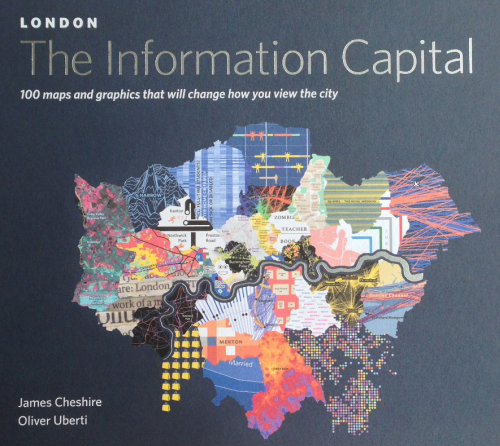 This really is a stunning collection of beautiful maps about all manner of different aspects of London and its populus. Each map has been carefully crafted to make the best use of the data and to speak to the theme of the map itself. Picking out one or two maps doesn't do it justice so here's a tip - go buy it. This is modern thematic cartography at its absolute best. All of these maps have got a fuller write-up on the ICA Map Design Commission blog this year. They contain large images and links where appropriate. That's it for 2014, unless someone publishes something fantastic in the next 15 days. I'm also looking forward to everyone else's lists. 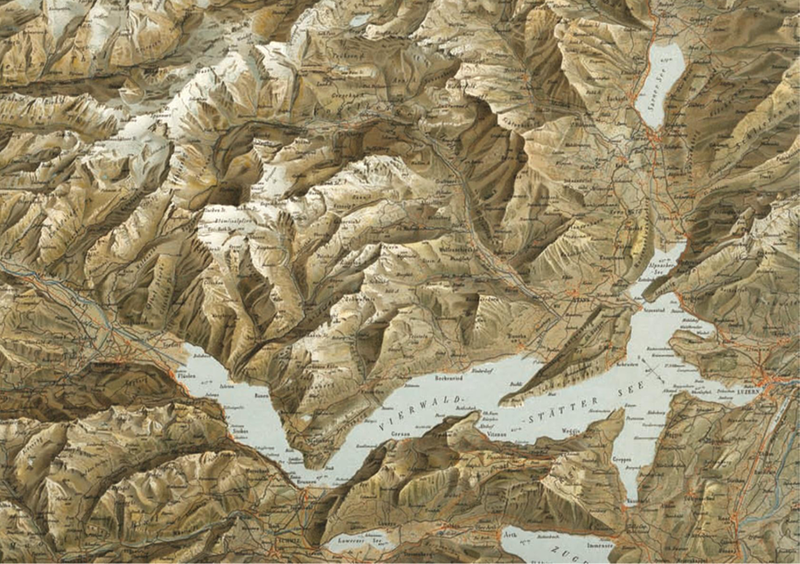 They're bound to be different which is part of the subjective beauty of cartography. I'm also likely to have missed some. When one thinks of a map depicting London, generally the image that appears is that of the map designed by Henry (Harry) Beck (1902 – 1974). It has become a design icon despite the fact that it eschews topography (other than the River Thames) and focuses on the simplified depiction of the topology of the Underground rail network. Beck’s map, designed in 1931, and first made available to London commuters in 1933, has become the image of the geography of London and, generally, the mental map that defines how London ‘works’. Station names have become synonymous with the above-ground landscape and the network is such that most of London’s landmarks can be readily located through the map. Navigating between them is a simple process and while the city above is a socio-economic and cultural soup, the simplicity of the map brings a sense of order, structure and sensibility. It is a perfect counterpoint to the chaos at street level. In cartographic terms, Beck’s map works and marries form with function perfectly. It retains the status of ‘the’ map of London and manages to simplify the network, be harmonious, coherent, balanced and all with minimal topographic distortion. The symbols are clear and well crafted; the composition and layout, though somewhat challenged by network changes since 1933, remains useful; and the design has remained relatively unchanged over the last 80 years which creates stability in appearance and breeds confidence in its use. However, in our recently published paper, William Cartwright and I assert that Beck’s map is over-used in myriad ways beyond the reason for its invention. The effect of such abuse has perhaps been to dilute its own place in cartographic history. 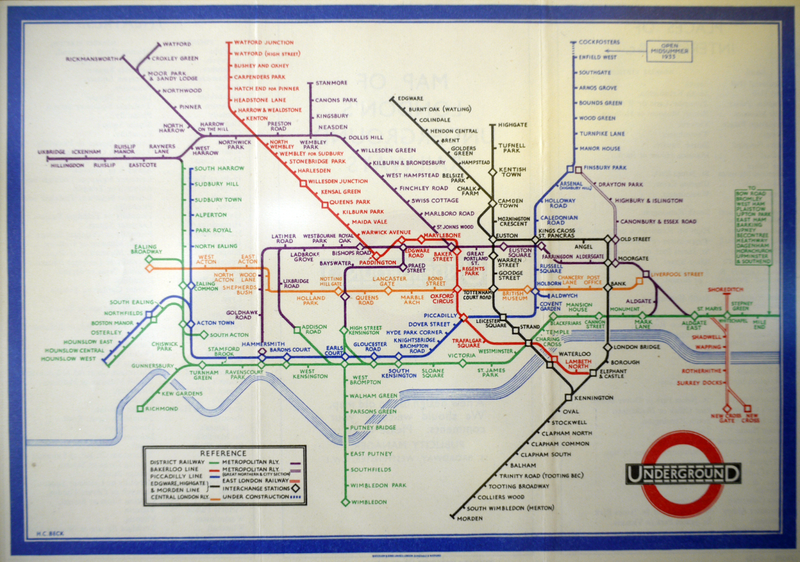 There have been many official iterations that have not always successfully married Beck’s design ideas with network changes; other metro maps have often tried to imitate but with mediocre success; and the map is perpetually used as a template for mimics and alternatives. The map has become a model for parody which we assert is bad for the map and bad for cartography. We've even created an ironic tube map of tube maps that acts as a monument to all of the maps we've found - over 220 of them. It's called End of the Line and you can view the full web map here or explore an embedded version below. 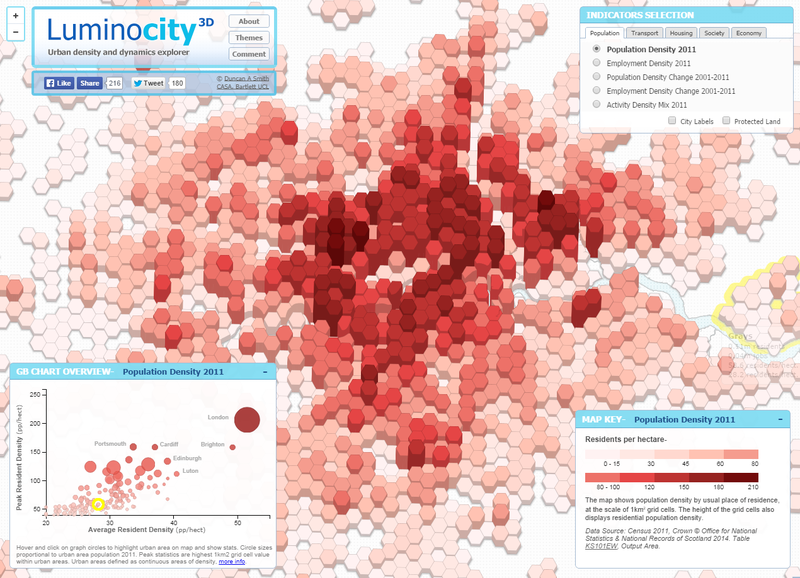 I've just had a good look at Luminocity 3D by Duncan Smith of CASA, Bartlett UCL. I'm impressed. Web mapping is beginning to show signs of getting beyond the infantile and maturing from its pubescent phase and this example shows what can be achieved when you consider the entire user experience. The maps are clean and well produced and there are plenty of them to support the inquiring mind, each accessible from a sensible tabbed box in the upper right. There's a permanent legend in the bottom right with not only a clear illustration of the chosen classification and shading schemes but a short description to assist interpretation. Nice to see data attribution and sources cited too. The title panel is sensible and although containing all the usual share and contact buttons is relatively unobtrusive. The graph in the bottom left is a masterstroke - it's linked to the map so we get a good scattergraph overview of the data distribution. Hovers provide the data summary and clicking a component in the graph orients the map appropriately. I really like the use of subtle graphical cues such as a slight animation to show an active element, or the emerging horizontal or vertical lines to anchor your eyes to the x or y axis. Likewise, hover controls on the map also deliver data summaries and the addition of a graphical yellow glow also gives focus. The ability to switch labels on and off easily also gives both unencumbered and contextual view of the map. I also like the use of data re-apportionment into a consistent regularly tesselated grid which overcomes the problems of trying to use different geographies. It also makes moving between maps easier and supports visual comparisons more readily. All that said, I'm going to get picky (because that's the purpose of the blog). I found myself frustrated by some of the cartographic choices. Firstly, while diverging colour schemes tend to make a map look more interesting (more colours) it doesn't fit the data in a cognitive sense. Most of the datasets would benefit from a single hue progression or similar. Most of the variables are mapped with some arbitrary break defined where one colour morphs into another yet the importance of that critical middle value is never established. Is it important? The use of a diverging colour scheme suggests so but it is unlikely. In fact, perusing through the maps shows an inconsistency in the graphical treatment. Most are diverging, some are single hue, others are multi-spectral (agh!). Second, while the use of a regular grid is great the use of 3D on most of the maps is distracting. It's effectively a plan oblique representation of the hexagonal grid using a second variable to map population or employment density. Fine in principle and allows the map to remain planimetric (thus preserving scale across the map) but where you see large numbers of tall prisms it inevitably obscures a lot of detail behind. Prism maps have always suffered this limitation and I can understand that mapping the second variable gives us an important additional piece of information but it's questionable whether the cost of occlusion warrants it. The answer would be to include an ability to view the map from multiple orientations either through a rotate tool or just giving us, say, four of the cardinal compass directions. At least that way the map reader can see what's behind a block of prisms through map interaction. Finally, the map works on multiple devices and some of the overlying boxes can be minimized - but not all. This does create a cramped feel on some devices and it would be nice for there to be more control over the position and visibility of these. Like I said, I'm being picky but I'd like to see the cartography match the levels of the overall app, particularly in the use of colour. 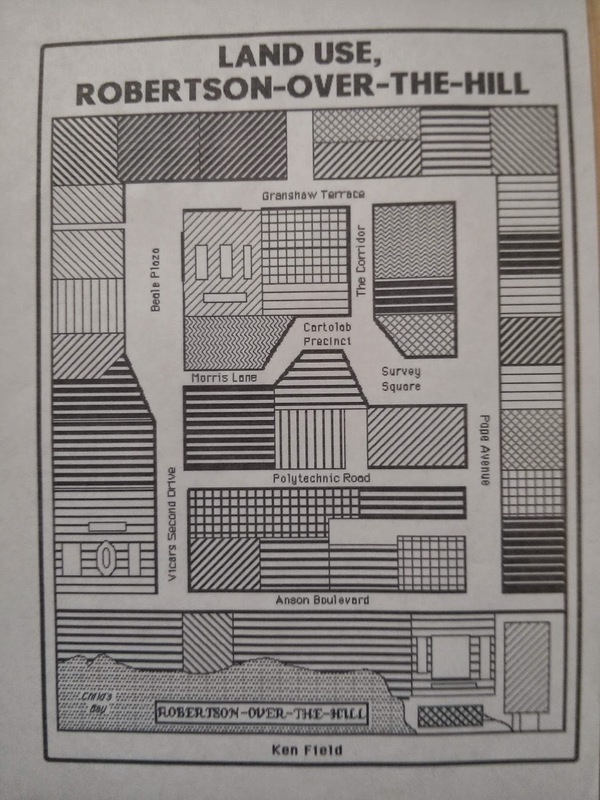 I saw an ad on television last night that may help the understanding of how cartographers think about good map design and construction vs what we perceive as poor map design and construction. It was for a new Pretzel Crust pizza available at Little Caesars. It's constructed with a pretzel crust as the base (poor basemap for a pizza in my opinion) and then goes on to slop on a thick yellow cheese sauce instead of a tomato based sauce (odd choice, gloopy and lacking taste), before topping it off with four more cheeses and pepperoni (solid choice for a final topping but a bit out of place on the base). Take a look and you decide whether any of this should be allowable on a pizza. The pizza appears at about 16 seconds...by 20 seconds I'd hope you won't want one...by 26 seconds I'm hoping you're wondering what the hell they were on when they invented it. If you're thinking yum, gotta go get one now then you may as well not read any more of this post. Want a pretzel? Have a pretzel. Want cheese dipping sauce with your nachos...go ahead (though forgive me if I don't - plastic orange goo isn't that appealing even in it's correct environs). But designing a pizza using these ingredients just doesn't work for me. If it was experimental then fine...but don't release it and ask people to pay for it. I wonder if I'm alone in this or whether sales prove otherwise? There are clear parallels to mapping. Start with any old basemap - probably a default topographic one because you don't know what the others are for or, even better, use a satellite image because that's colourful and detailed and more must be better. Then slop some data over the top. Don't pay much attention to symbol choice or design...just dump your data across the top and smear it around. Actually, make it bright because it won't show up on the satellite basemap unless it's bright. Then if you have some point based ingredients (e.g. emoji...see previous post), position these across the top. Finish off with a smear of butter and a good dose of flavour enhancing salt and boom - you made a pretzel crust map. Whatever you call them: pictograms, pictorial markers and mimetic markers have always been hugely important in cartography. 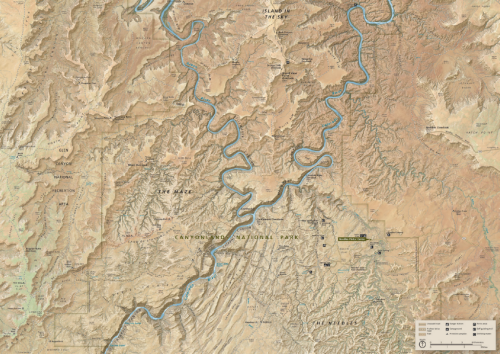 Well designed graphics that are used to represent a point of interest are fundamental to topographic mapping in particular but have become vital for web maps that show points of interest across a basemap. They should be clear, unambiguous and allow us to efficiently communicate the feature with simple graphic clarity. They should work in harmony with the rest of the map and subtlety often leads to a well balanced overall map. They're not easy to design though. You're often working with a very restricted size, perhaps pixel count and, ordinarily, a single colour. With all those constraints it's often difficult to imbue symbols with the meaning required if the intent is to support a map reader's ability to understand the feature without constant recourse to the map legend. This reason alone is why it's more common to use pre-defined symbols delivered as part of your software or available online. There are perfectly good repositories for symbols (e.g. 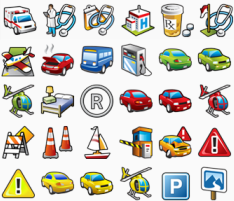 Symbol Store, Maki) but what about emoji? 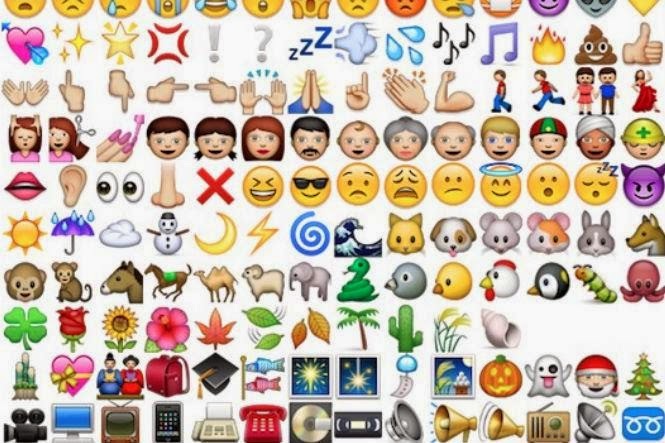 Emoji - the Japanese pictographs which have become standard in electronic messaging. They're increasingly used as shorthand for all sorts of communication. Their increased use doesn't, however, mean they are well suited to being placed on a map. Take a look at this map, made by Katy DeCorah (click to view the live map as part of Katy's blog). Katy's blog entry explains she was interested in exploring a technical challenge, and she succeeded. But what of the outcome? Once the technical challenge had been achieved we still need to consider whether it's useful in a cartographic sense and in this case I'd suggest it isn't though Katy did at least use a limited set of POIs and did a good job of picking an emoji that vaguely represents the feature being mapped. One of the tenets of the cartographic design philosophy that I was taught was to keep things simple. The KISS principle (Keep It Simple Stupid) holds true for 99% of cartographic tasks. The best advice any budding cartographer can heed is to learn how to be comfortable omitting detail in terms of the overall map and also the individual elements. Creating clean, simple lines leads to a much more harmonious map and one that is, crucially, much easier to disantangle and read. Symbol design goes a long way to creating that harmony. Just because a set of symbols is technically capable of being put on a map doesn't mean they should be. 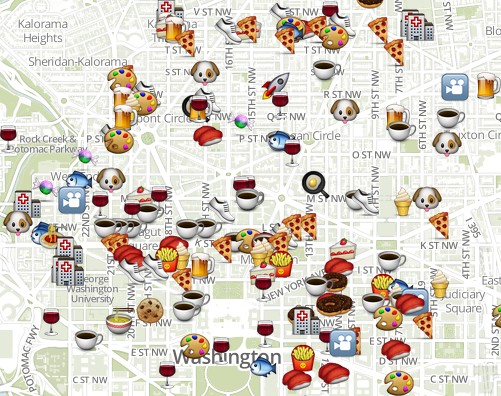 Slopping emoji (or other 3D style, multi-coloured, shaded pictorial symbols) all over your map just doesn't work. Use them in your social messaging where a single emoji is often added as an exclamation or to characterise an emotion. Please don't use them en masse on a map...it hurts the eyes and as Kirsten Dunst might say, it's just a piece of poo (ht Craig Williams). Cartography has always reinvented itself. This is partly as new technology matures and we're able to do things faster, better and more easily than before. We tend to experiment on tried and tested techniques to replicate them as a means of testing. Technology catches up and a map is released on the world who mostly won't have seen it before... but which can have the unintended consequence of appearing to reinvent or, worse, plagiarising to those that have. Is this a problem? Unfortunately I was unable to attend the 2014 FOSS4G conference in Portland this year. I thoroughly enjoyed being part of the 2013 event in Nottingham, UK where I helped organise and curate the Map Gallery. I was therefore very interested in seeing how the maps have developed for the 2014 event though I had to sadly decline an invitation to help out with the judging! The entries and results can be seen here. There were the usual mix of mashups and people simply entering re-styled Openstreetmap data. The former seems to be continuing to mature as we're moving beyond push-pinology. The latter, for me at least, is getting rather tedious. It's great that there are many tools out there that allow people to re-style basic topographic map data but that only sustains cartography for a limited time. It's painting by numbers, literally...and cartography is far more than that. It's what you do with your map and how you integrate the base mapping meaningfuly with your own or other data where something interesting happens. That leads to a third class of map...the ones that don't pour themselves into a template or use too much third party data or tools. It's in this space that we're seeing quite a bit of invention (and reinvention) as people make use of new browser capabilities or their ability to customise through code. I was therefore delighted to see my good friend and colleague Bernie Jenny collect a couple of awards for the Plan Oblique Relief Shading work he's been doing with Jonas Buddeberg and Johannes Liem. Bernie's been doing fantastic things in cartography for a number of years. 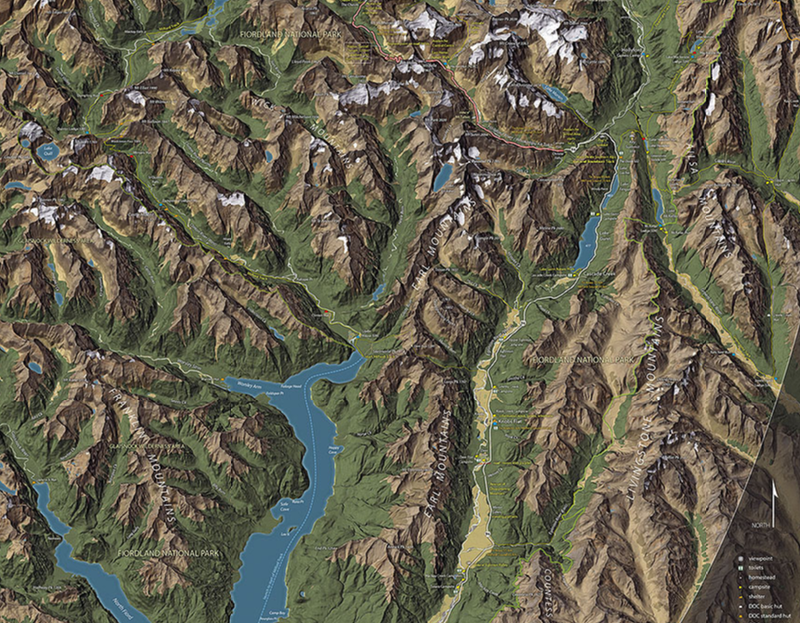 His relief shading web site and his many software tools show off some of the products of his research into the cartographic representation of terrain. 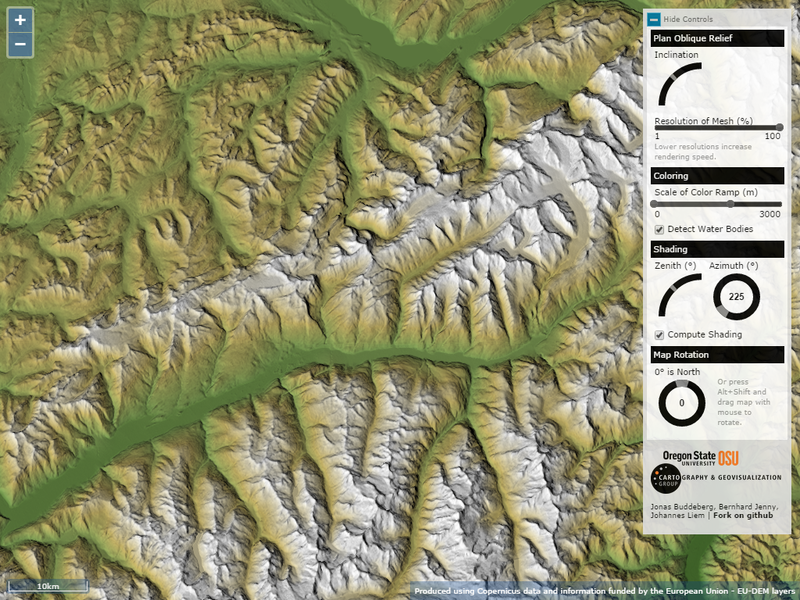 I particularly like his Terrain Bender tools and his Adaptive Composite Map Projections work. The Plan Oblique Relief web app is terrific. He and his colleagues have built a new, interactive app that allows you to play with the variables to see how the technique gets modified for European relief. Inclination, hypsometrical tints, hill-shading zenith and azimuth as well as map rotation are all supported. I'm going to assume the awards were for this innovation though there's a part of me who wonders how many of the FOSS4G attendees had seen plan oblique before? We'll never know that...but Bernie's new work, with new technology brings to life a technique that can be traced back to Xaver Imfeld's work in 1887. I would like to see more people do their due diligence and both reflect on the lineage of their own work and be clear about their inspirations. I see far too many map-makers try and pass off their work as 'new' when in fact you don't have to dig too far to see that someone else has gone before. Imitation is, of course, the sincerest form of flattery and I have no issue whatsoever with people building on the work of others...but that's the point. Your work should build upon something and be clear about its heritage. Old is always new again in cartography. Perhaps we just need to be a little more honest in appreciating that fact rather than trying to leapfrog the past and hoping our map-readers know no better. I've been caught out by this before and I claim to know a little about maps. It is incumbent on us all to not try and dupe our map readers because they will have less reason to question authenticity and lineage. Bernie and his like are excellent role models for how we should portray and communicate our work. As a postscript I've been trying to engineer a plan oblique technique in my day job with ArcGIS. No luck yet but I'll crack on. Alberto Cairo's great blog post on the issue of constructive criticism and snark (as in snide remarks) turned into an interesting discussion with some really good contributions. Muggins waded in because I was mentioned in the original post and thought I had some comments to share...including a throwaway line about my first map getting an A+ at University. And my, didn't the inevitable people enjoy that nugget and wade in with some snark of their own. Curious that because they're the very same people who purport to hate anyone throwing snark in their direction. Anyway, I've got to hold my hand up...it wasn't an A+ I got, I dug out the work and dammit...just an A. 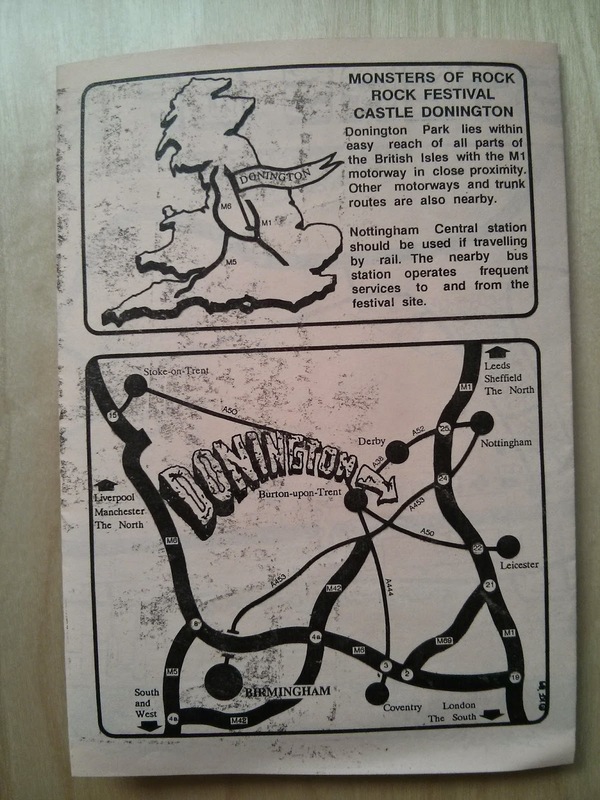 So just for your enjoyment here's the cover of my very first map from University in 1989. The copy I have is getting a little tired and the ink has smudged but the map is still fairly legible. All hand drawn on drawing film with computer generated lettering positioned by hand, symbol design, drawing pen on film etc etc. Lots of work went into this little map. 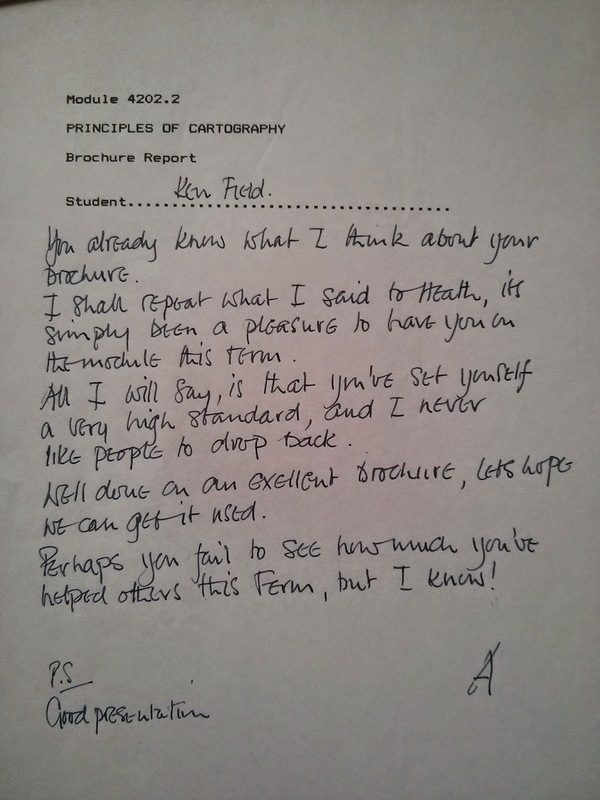 And here's my lecturer's grade and feedback of which I remain very proud. His name was Roger Anson...a damn fine man and a brilliant lecturer. I was privileged to have learnt cartography from him and his colleagues Mike Childs, Stuart Granshaw and John Robertson. I've always been particularly proud of his last statement. I always have been someone who tries and helps people do better work. It's why I eventually went into academia and enjoyed helping my own students aspire to be better and to achieve their own goals. It's why I moved to work in the U.S. to help the company I work for make better products to help people make better maps. It's why I take a full and active part in the community with this somewhat snarky blog and a whole load of other far more sensible and unsnarky work. So there you have it friends...or if you're not a friend and just someone who thinks they know me through my tweets and this blog then maybe we'll get a chance to meet one day and share some constructive ideas. 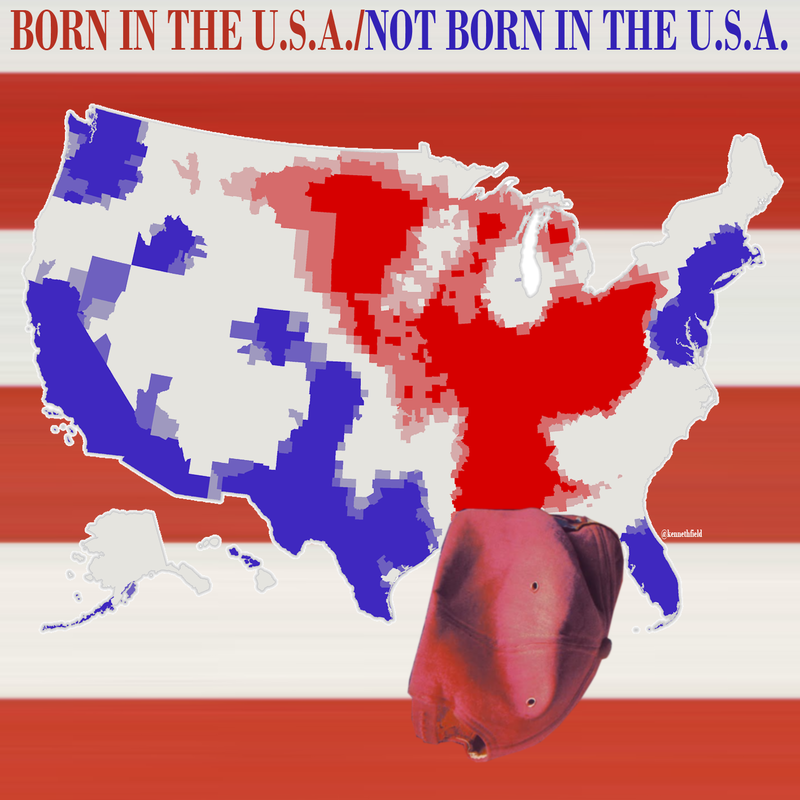 LyricMap: Born in the U.S.A. Number 3 in an occasional series of LyricMaps is loosely based on Bruce Springsteen's Born in the U.S.A.
A hot spot analysis (using Getis-Ord Gi*) in GIS defines statistically significant neighbouring areas that are above or below the global average. Stronger red hot spots define neighbouring areas that have either more or less people born in the U.S.A., compared to the national average. 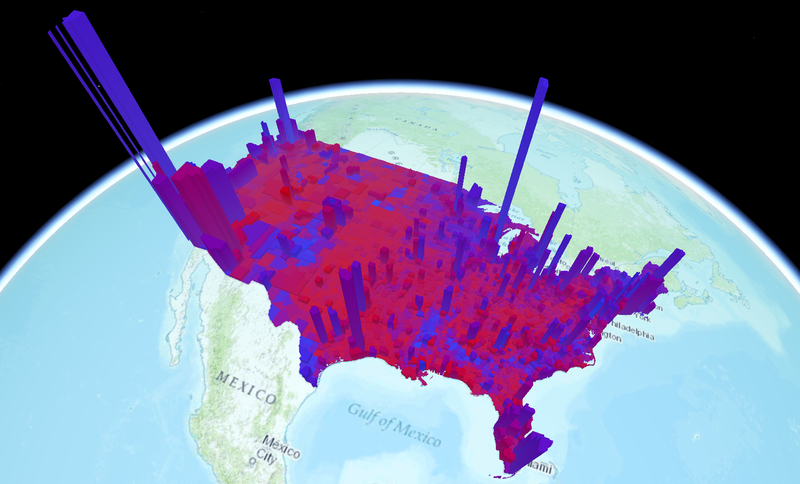 More red (a hot spot) equates to more people born in the U.S.A. and more blue (a cold spot) equates to more people not born in the U.S.A based on data from the 2010 census. Areas shaded in neither blue or red have no statistically significant populations born in the U.S.A. or not so they are similar to the national average. The counties in New Jersey, Bruce Springsteen’s home state, are all cold spots with more people not born in the U.S.A. unlike Bruce. 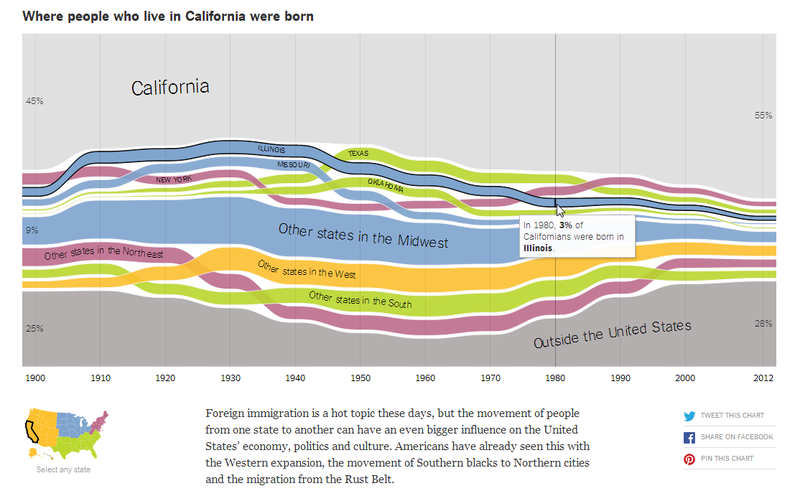 The New York Times flexed their considerable graphic muscles this week with some superb interactive charts showing how the population composition of U.S. States has changed over time. You can check them out here. They really are beautiful graphs. Simple, clean, lots of 'white space', good hierarchy of typeography and excellent use of colour linking to a small map legend. They even provide some additional discussion and as you hover over the graph the intersection between time period and place gives you some basic metrics. 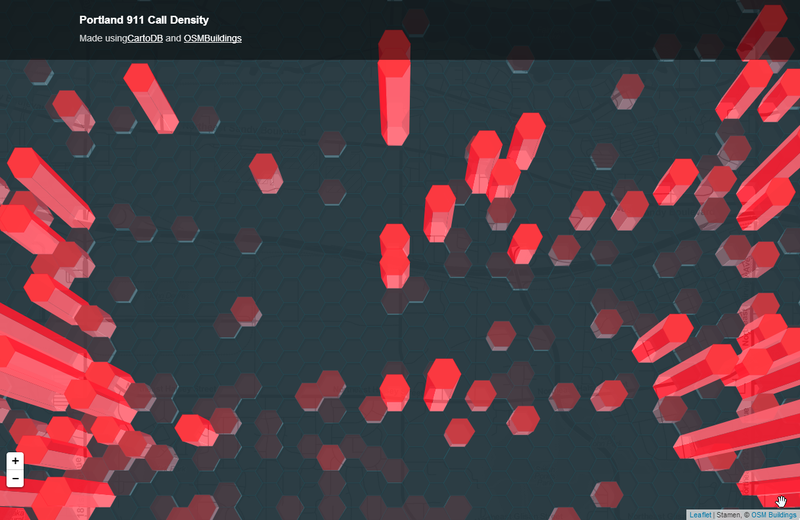 They then added to this excellent set of graphs with an interactive map of the same data; a new kind of map that they're calling a voronoi treemap map. The data has been pivoted so the focus is on space in contrast to the focus being predominantly on time in the graphical representation. You can pick one of three time slices to explore how patterns vary spatially. The hovers still work extremely well and one click zooms to a state...great user interaction and experience. The benefits of looking at a map instead of the graph are that it should support the visual comparison from place to place. 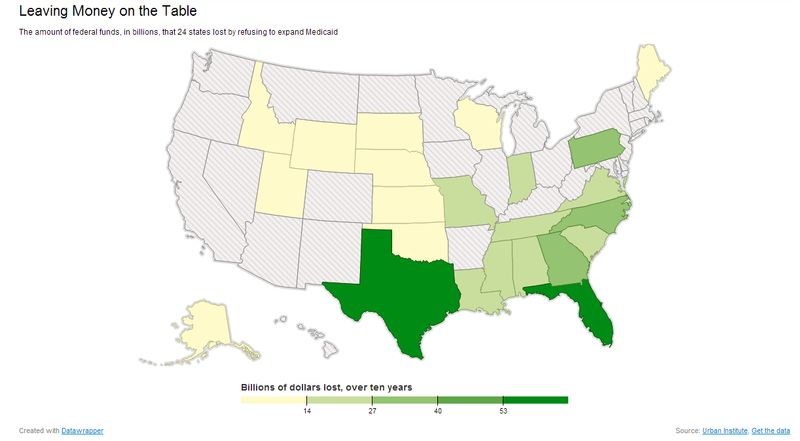 That's not something you can do with the graphs with each one only illustrating a single state...but what about the map? What fascinated me about the map is the technique. The use of voronoi polygons to sub-divide space into a tesselation of shapes that represent different proportions is nothing new. Treemaps are also nothing new and have been used very successfully as a sort of area-based cartogram. Here, though, NYT have combined the techniques and used a bounding space (each State) inside of which space is tesselated based on the proportion of the population from different other places. 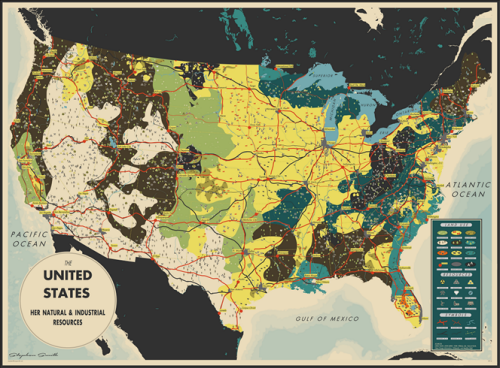 It's not something I've seen before and it's always worth looking at experimental cartography. I like the idea and I like the attempt at trying something new. However, I see two issues that I feel undermine the map and what it offers. Firstly, the voronoi polygons are only proportional intra-state and not inter-state so you get polygons with the same percentages of populus that are visually quite different to polygons with the same value in another state (see Texas compared to Oklahoma state-born residents, both 61% but one visually dominates). The point about putting anything on a map is to create visual comparisons and the voronois are, effectively, unequal in area from state-to-state so incomparable visually. The relative areas of each state underpin what we see. Since we're visually comparing one place to another and forming a mental picture at first glance Texas would seem to have a larger number of State-born residents than Oklahoma. I'm not sure there's an easy solution unless you turn the voronois into a population-equalizing cartogram (e.g. the Gastner Newman) to account for the different sized areas. It'd certainly be interesting to see what happens if they were equalised by population or area. My second observation is really just about the design and layout. In each state the surrounding voronoi fragments seem to be randomly positioned around the central voronoi polygon that represents the people born in-state. If you look at the small legend map on the graph version you see that the orange, green, blue and pink colours are used to suggest west, south-west, north and north-east. It would have been nice if the surrounding voronois were arranged so they sit on a compass direction to where the state actually exists. So for each state the oranges would always be on the left, the blues to the north etc. This may bring some sense of structure to the map and avoid the somewhat random positioning we currently see. Overall I think there's a lot of merit in this new map technique but it probably needs some more thinking to make it really useful. Not a week has gone by since I posted about the problems of comparing areas between places using Web Mercator. 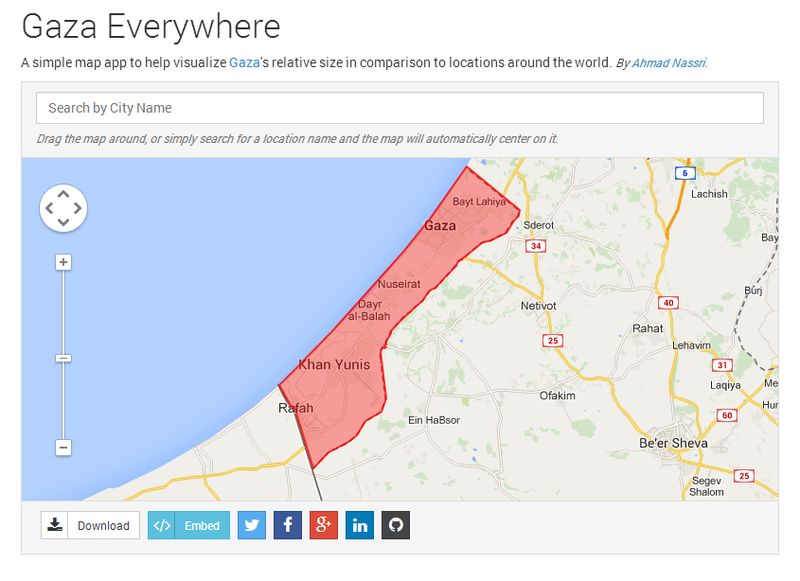 Here's a 'simple map' (author's phrase) that allows you to compare Gaza with other places on the globe. 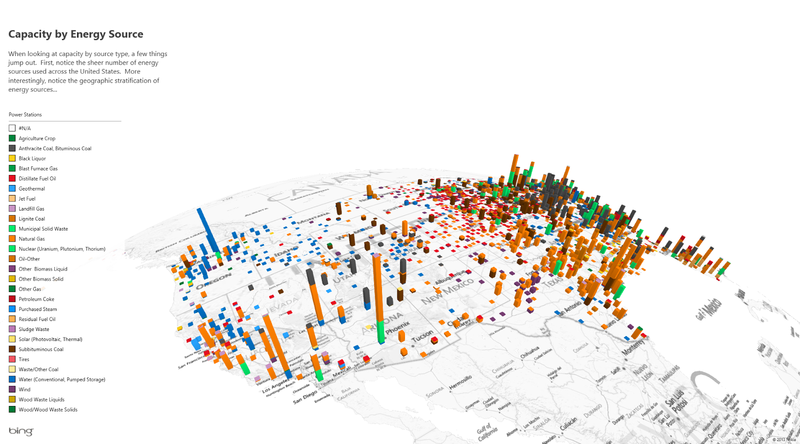 The interactive version is here [map now corrected]. Terrific idea...take the outline of Gaza and allow people to enter a place they are familiar with in order to better understand the size of the place in comparison with somewhere they know. Except the basemap is Google's Web Mercator (other Web Mercator basemaps do exist) and the shape has been drawn across the map. Only places directly on the equator contain no areal distortion on Web Mercator. Gaza lies at approximately 30 degrees North so there's already considerable distortion in the area of Gaza on Web Mercator. If you then pan and zoom the map, the Gaza shape remains the same size and shape (at each scale) wherever you go to on the globe. It does not get reprojected as you move across the map and that's a huge cartofail fail regardless of the projection. As we saw in my previous post by looking at Tissot's Indicatrix the size of areas gets massively distorted across Web Mercator. The shape of Gaza would be no different. Unfortunately this is not accounted for in this map. A classic case of ignoring the impact of map projections. Unless you compare Gaza with somewhere else that is exactly 30 degrees North (or South) then you're comparing one distortion with another and the relative scales of the overlay graphic and the basemap are out of sync with one another. The map, then, is utterly useless and, worse, people look at it and believe that it accurately portrays the stated aim. It doesn't. A lot of people say to me that the science of cartography has little relevance anymore and it's all about form over function, or function over form and that rapid hackups that buck cartographic convention are healthy. If those that (a) build this sort of cartofail and (b) those that unwittingly consume it are happy then there's no hope. Unfortunately experience shows people tend to be happy in their ignorance and prefer their own facts over fact itself. If you make maps, learn some basics...it's really not that difficult but no amount of clever coding allows you to ignore the basic science of the very thing you're coding. Use your coding skills wisely and learn some domain knowledge to give those skills real power and substance. ht to Ryan Cooper for alerting me to this map and for correctly identifying the problem. UPDATE: Something unexpected happened after Ryan Cooper, Ralph Straumann and I tweeted and blogged about the problems of this map. The author Ahmad Nassri got in touch. I was primed for the usual volley of abuse but unlike the majority of people who seem to take offence at having a critique of their work plastered online pointing out major faults, Ahmad took the opposite view. An online conversation took place in which he was grateful for someone identifying a shortcoming and eager to learn of the cartographic 'problem', he sought help in figuring out a way to overcome it. His reaction was refreshing and a credit to his desire to get his work 'right'. Within a couple of hours he had figured out a way to control the shape of Gaza using the Google Maps API geodesic parameter so that it would draw geodesically as you pan and zoom around the globe. It doesn't get over the problems of Web Mercator but it does make his Gaza shape scaleable across the globe to work in sync with the projection. Both the map and the shape of Gaza are now distorted in the same way which is as much as can be hoped for if Web Mercator is the basemap. The map now does what it claims, it gives people the correct basis for visual comparison but most of all Ahmad illustrated a willingness to take on board our comments and correct his work. He should be hugely commended for his reaction. Win win! Getting the curved surface of the earth onto a flat map (paper or screen) requires a map projection. The reason so many projections exist is because there is no perfect projection and they all contain distortions which affect area, distance, shape or size...and distortions vary to different extents across the map. While for most people, the often complex mathematics of transforming locations to the map is beyond their expertise it's important to pay some attention to the choice of projection. Choosing an appropriate projection is vital to ensure that the inherent distortions don't wreck the very purpose of your map. We can see what happens to distortions when we overlay Tissot's Indicatrix on the curved surface of the earth. 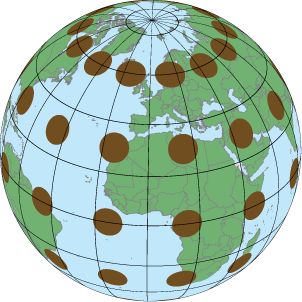 The Indicatrix is simply a grid of equally sized circles (on the globe) which are a very familiar shape which makes it easy for us to see what happens when it gets distorted through projection. 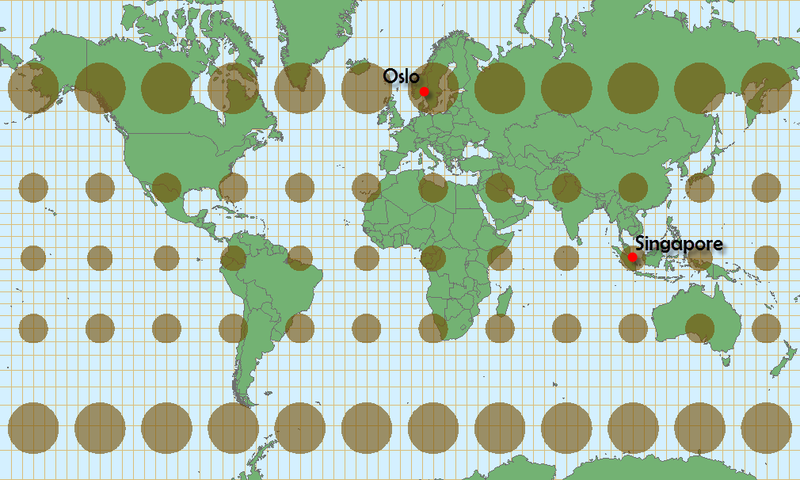 When projected, the grid of circles of equal size, shape and area are distorted which gives us a clear indication of what happens to the real geography that gets projected at the same time. Web Mercator preserves angles (which is why the circles retain their shape) but distorts size, and, fundamentally, area. It's great for navigation (its intended purpose) but dreadful for most other purposes. Now let's compare the two cities marked on the map...Oslo and Singapore. Oslo is at 60 degrees North. Singapore is pretty much on the Equator at 1 degree North. There's virtually 60 degrees of latitude between them and looking at the two Tissot Indicatrix circles they fall in you can see the distortions that Web Mercator creates in the size of area between the two places. If you examine the size of the two circles you find that the Indicatrix around Oslo is approximately 75% larger than the one around Singapore. Let's have a look at the impact on a real map. The following maps are on Web Mercator and both at a scale of 1:250,000. Oslo on the left, Singapore on the right. Now let's look at exactly the same map but projected using a Cylindrical Equal Area projection. I've switched the standard parallel to 60 degrees North for the Oslo map just to ensure the shape isn't distorted compared to Singapore but areas are consistent between the two maps. Now compare Oslo with Singapore. Oslo is now shown at the correct areal extent and size compared to Singapore. The distortions you see in the size of text etc is simply because the map tiles used to display this were originally in Web Mercator...so the fact they are now reduced in area by about 75% actually results in the map looking like it's shrunk. It has! It also shows how much Web Mercator tiles are distorted in terms of area the further from the equator you go. The answer...pick the right projection for the right job. You can go beyond Web Mercator on a web map so it's just a case of figuring out how to do it using your technology of choice. If you're going to be comparing areas either for city comparison or for thematics you really do need an equal area projection unless all of your cities sit on the same degree of latitude. If not, you're literally pulling the wool over the eyes of your map readers and they leave with a totally distorted impression of the themes mapped. Next time you look at a map whose purpose is comparing places just pause to check the projection and then make your own decision whether you can trust what your eyes are telling you. I've always been intrigued by the potential for 3D in thematic cartography but it is that much harder to get 'right' than 2D...and look at what a mess many get in when trying to make even the most basic of 2D maps. We see the world in three dimensions because we were given two eyes and stereoscopic vision. That gives us depth perception. In making maps on a flat surface (paper/screen) to mimic how we see the world we have to go beyond our basic palette of visual variables and symbol encoding and play with additional variables. We have to make the eyes see the third dimension. The standard way of achieving that is to make the map in a perspective view...near things are closer to the eye than further away things. We can accentuate this by perhaps adding a sky in the background (to mimic a far off horizon) or add in haze to diminish objects further away in the same way as haze affects our view in reality. This generally works well for maps of the natural world....mountainscapes and street scenes for instance. But this approach doesn't apply equally for thematics because the principle objective is to create a consistent view to support comparisons across the map. The perspective view does not support that cognitive need. Take the following example in which the Obama/Romney 2012 percentage share of vote election results are shown using a diverging hue colour scheme. 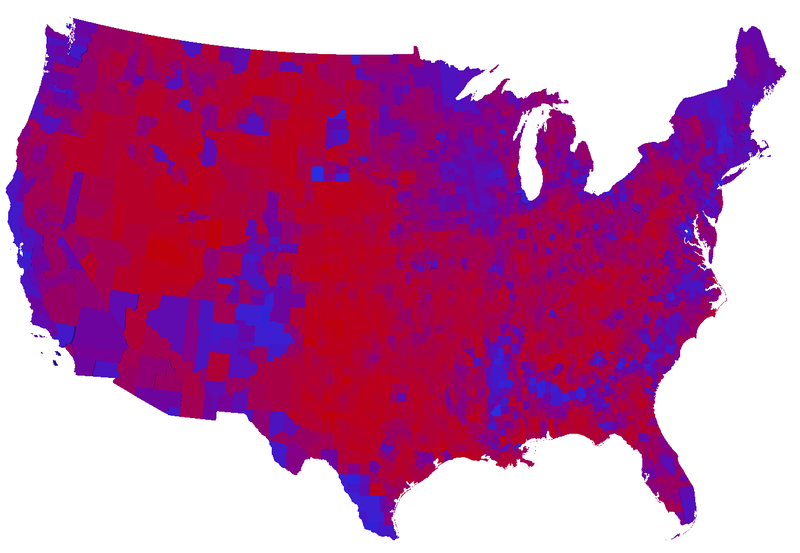 Increasingly blue = Obama, Increasingly red = Romney. purple = equal share. 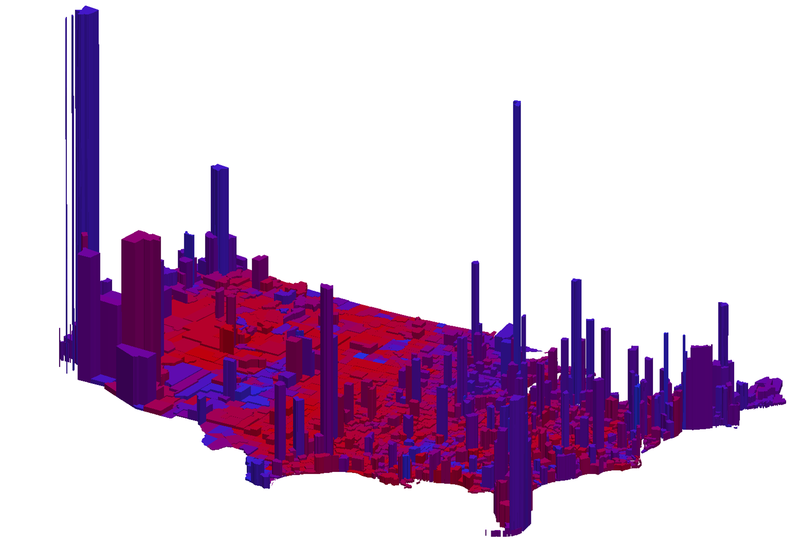 What the map doesn't show us is how many voters there are in each county which might help us better understand the reason Obama won...so let's whip it into 3D and use extruded areas to show the number of voters. Simply placing the choropleth on a virtual globe and extruding areas is a very common approach to 3D thematic mapping but it's bloody awful! The perspective view seriously compromises our ability to compare the height of our extrusions like-for-like. The foreground is nearer the eye than the background. Worse, the curvature on a virtual globe alters the shapes as well so we're seeing all sorts of distortions that our brains have no hope of disentangling. The “fish eye lens” effect mean each prism is viewed from a different angle than its neighbors, making comparison just a little bit harder as we have to mentally account for these differences in our estimates. It's hard to judge the height of something when you are staring directly down at it too...look at those areas in Florida. This matters because height is the visual variable that does the “work” in this map—it’s how the data are encoded visually. The map tells us (yes, it does...in the blurb at the top) that we're seeing a clear stratification of energy sources across the US. Are we? I just see a map whose visual centre is focused on the sparse areas in the middle (the least interesting datawise) and a load of 3D columns of various colours fading off and disappearing over the horizon. It's like the data is running away, off the edge of the map, scared to be party to the horrific map it's been placed on. In this example, 3D kills the map. The intent to 'look cool' by using a curved virtual globe destroys any hope of the reader being able to see any patterns. Look at the large orange bar in Arizona toward the front...is it taller or shorter than the one you see poking out above the skyline in the north-east? Who knows...but I bet they're about the same value. And stacking colours on top of one another makes the top colours more prominent anyway. Who knows what's hidden from view in the east. And finally, what of the colours...nearly 30 of them. The map reader has no hope of figuring out the difference between distillate fuel oil and petroleum gas...or geothermal and purchased steam. The title is meaningless. The legend shows us T-Mobile's data network usage in the slightly darker pink among their partner networks in slightly lighter pink. OK - it's an advert. The point is to show complete nationwide coverage and they wanted something a little more visually striking than a choropleth so...threedee it! Except compacting the map by putting it on its side and tilting it so dramatically makes it impossible to see where all those columns actually sit. And what's the vertical scale? It seems that the base height is actually extruded a fair bit to give the impression that perhaps even a small usage/coverage is a little larger than it might actually be. The map is designed to obfuscate reality because it's an advert...but if we wanted to make sense of the actual distribution the 3D approach kills it. Andrew does some great work and pushes what technology allows. He also brings a fresh perspective on making maps that pushes the boundaries and challenges long-held principles. That's great in many ways but there also has to be a sense of understanding when the outcome doesn't stack up cognitively. The hexagons have been used to bin the point data (911 calls) and height of the prism relates to quantity. All well and good to this point...but try and compare height relative to an absolute vale or relative to one another and you quickly become disoriented. Technically this is cool, no doubt. Cartographically it's questionable...very questionable, because it doesn't support the necessary cognitive processing needed to understand the pattern. Now unless you're going to provide the ability to rotate and interact with the map, you're going to still suffer the problems of occluded data but at least here each column is in the correct relative proportion to one another. We can accurately compare heights across the map and make sensible inferences. The interactive version is here which supports rotate, pan and zoom...though be warned that another difficulty with interactive maps is the constant ability to rotate, pan and zoom means we lose track of our visual anchors and this generates short-term memory flushing. In other words...you easily forget what you just saw and that means you lose the ability to build a comparative picture. There we go...some thoughts on threedee thematics. In short...stick to 2D unless you're prepared to go the extra distance to deal with the additional problems 3D creates. If ever there existed a reason for cartography then this is it. Possibly the year's worst map so far. It was on the New Republic web site today as a map to accompany a story by Jonathan Cohn. There is nothing about the map that is correct...actually, that's a lie...the projection (Albers equal area) is correct. The data, however needs to be classified, it needs to be normalised and it needs a sensible, sequential colour scheme. To be fair to the guy he's taken some serious social media heat and redrawn the map. The data is now classified and he's got a decent shading scheme. Still not normalised though...so it's impossible to make any sensible visual comparisons. Is the availability of tools to allow anyone to make maps a good thing. Yes...as long as those same people appreciate that if they are going to do so they are obliged to learn how to avoid the basic mistakes as a bare minimum. Cartography exists to guide people. Yes, there are basic cartographic rules but they are designed to tell map-makers how people read maps and, therefore, how to design them to make sense and be useful. 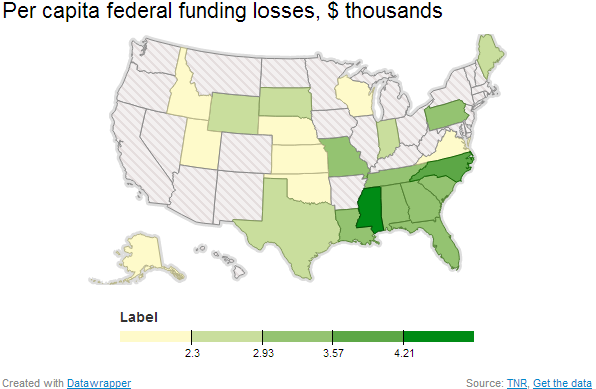 If you're going to make a map of your data, ignore cartography at your peril. And as I type...Steve Koczela has re-worked the data into per capita so here is a 'correctly constructed' map. Good projection...classified sensibly, decent shading scheme...and normalised data so we can compare like-for-like across the map. All rise! So there you go...the first map shouted Pennsylvania and Alaska (bright colour catches the eye). 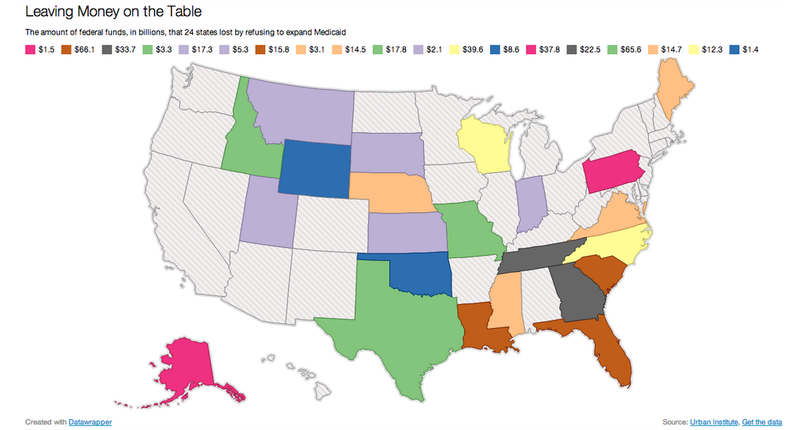 The second map told me Texas and Florida were screwed (darker colours = more). The final map...Mississippi by some margin from North Carolina. Texas isn't that bad after all. 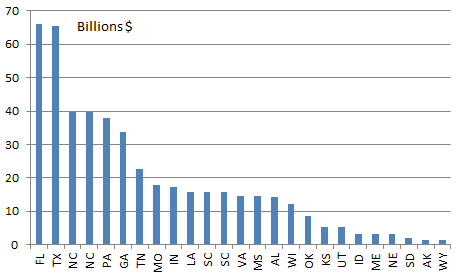 Finally...a small parting shot...with about half the states missing data...maybe this would look far better as a bar graph anyway? 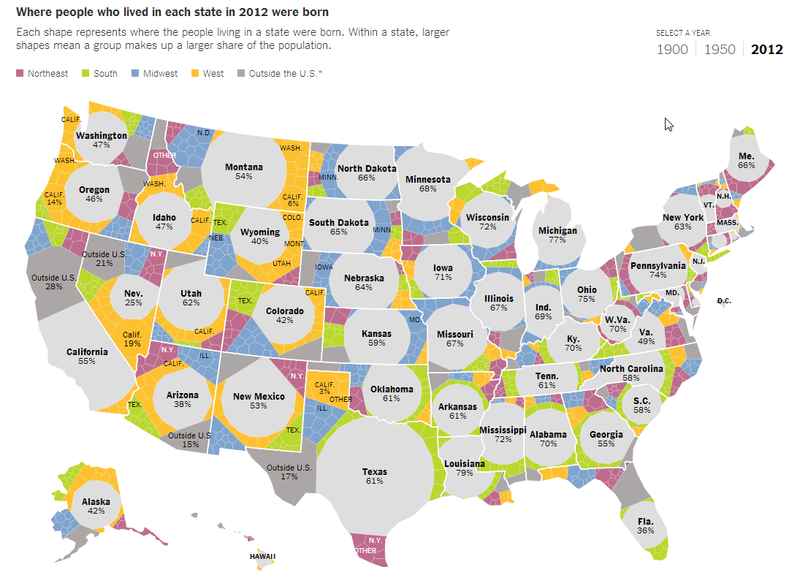 UPDATE: Cohn has updated his web page to include a per capita map. As this blog is set up entirely to point out cartographic mistakes (often with a little of my cursed British humour thrown in which I know isn't to everyone's taste) it's a welcome sight to see people respond and correct their efforts where necessary. I admire Cohn for taking the views of this commentator, along with many others, into account and correcting his mistakes. It's encouraging that some actually do want to learn and move forward with their work. There's also a nice write-up of the need for constructive critisism spurred on by this map over on Alberto Cairo's excellent blog. As regular readers know, this entire blog is set up to fight the fight against cartofails. It's written in a jocular style with my British sense of dry humour. I was born with it. It's just the way we're built. Where I can I provide clarification on why a particular map fails and how it can be improved. Occasionally I even re-work stuff to show a 'better' alternative. Remember, this blog began with my correction of the True Size of Africa cartofail by Kai Krausse and my very first blog post. I recently did a reworking to show where The Proclaimers may have reached in 500 miles. Over the last few weeks it's picked up quite a head of steam and been featured in Slate, The Atlantic's Citylab, got to Number 1 on the Reddit Mapporn sub-Reddit and even warranted a post by that most nonsensical Twitter account @Amazing_Maps. And today it again popped up in The Telegraph...once a respected, though very right wing, British newspaper. All terribly prestigious coverage for what must rate as my most frivolous mapping project ever. This latest effort by James Edgar has me wincing and has my friends and colleagues chortling into their corn flakes. Edgar has reworked the story from a collage of other sites and it shows. I'm introduced as a pedantic cartographer. Yeah yeah, maybe that's true but why is it that virtually every cartographer get's labelled as pedantic, picky or awkward as if it's a fundamental flaw in our character? These labels stick and really don't help the cause. It's like every scientist has to be a boffin or, dare I say, every journalist is accused of lazy journalism. Actually yes...that's exactly the point. Lazy journalism. How does correcting a common mapping error by making the effort to show and explain the error with the intent of improving people's appreciation of maps become something to deride? Pedantry is an obsession with 'minor rules'. Sorry pal, but these minor rules actually become very important in mapping even if you neither care nor know about it. It's not about precision as Edgar suggests...I was not making a more precise map...I was making a correct map for the projection used (Web Mercator). Apparently I "created an accurate projection". No...I did no such thing, the projection already exists. What I did was map correctly on top of it. He goes on that I explained that "simply drawing perfect circles around the start point on a flat world map would not offer a true indication of where they could get to". Actually I didn't say that. You can draw perfect circles on any flat map that uses a conformal projection. You cannot on Web Mercator (actually, strictly speaking you can...they just won't be perfect circles when projected back onto a spherical surface). It's a function of the mathematical projection, not the fact the map is flat. Apparently I then used a "clever computer tool called a Web Mercator". Seriously? Did you not even use Google to check Wikipedia to find out what Web Mercator actually is? Comments are not enabled on Edgar's post so I have no right of reply. He didn't contact me before running the story so i cannot even claim I've been misquoted. Let me finish off with some true pedantry. Edgar refers to me as Mr Field. It's actually Dr. Yeah, that's pedantic but heck...I have a qualification in my area of expertise. The Telegraph? Wow...more like the Daily Mail. The first test is simple...does the work you are looking at leave you asking so what?. This is how we used to assess student dissertation proposals and get them to reflect on whether their proposal was worth doing. Was it persuasive? Did it make me want to know more...to explore or find something out? Did it make me care? All maps ought to, at some level, inspire their intended audience to want to care about what it is that's being illustrated and the message of the map. It has to have a function and if the form is well crafted that function should be visible. The map may very well have a good purpose to the map-maker but has that been extended to an audience? This isn't an exact science though. Different people and user groups have different so what thresholds and so what works for one may not necessarily work for another. This is where a consideration of the audience comes in when you are making a map. Engage your audience first. Bring along others if you can. Pleasing everyone all the time is impossible though. It's also perfectly reasonable to experiment and at the moment we're in a period of cartographic development where technology is out-pacing best practice. Animation and 3D are just two areas that we've always played with but now the tools are mature enough to allow people to really get their hands dirty...and they are. At the moment there's too many failing the so what? test. This may not be a bad thing IF it leads to new ways of working that make good use of the techniques. Let's assume people have got past the so what moment because, let's face it, if they haven't then they've already clicked to another web page or left dissatisfied with your work. Upon inspection, does the map give you some sort of mini-eureka moment? Is the message communicated with clarity and has the map-maker made it legible? Clarity and legibility are key though they are not the same thing. Clarity relates to the message. Has the message been encoded into the map's syntax effectively. Legibility is the way in which the map-maker has brought focus to that message through effective graphical structure. Put simply...do you get it? This is the ah-ha! moment when you realise what it is you're supposed to learn or find out. It should come relatively easily. 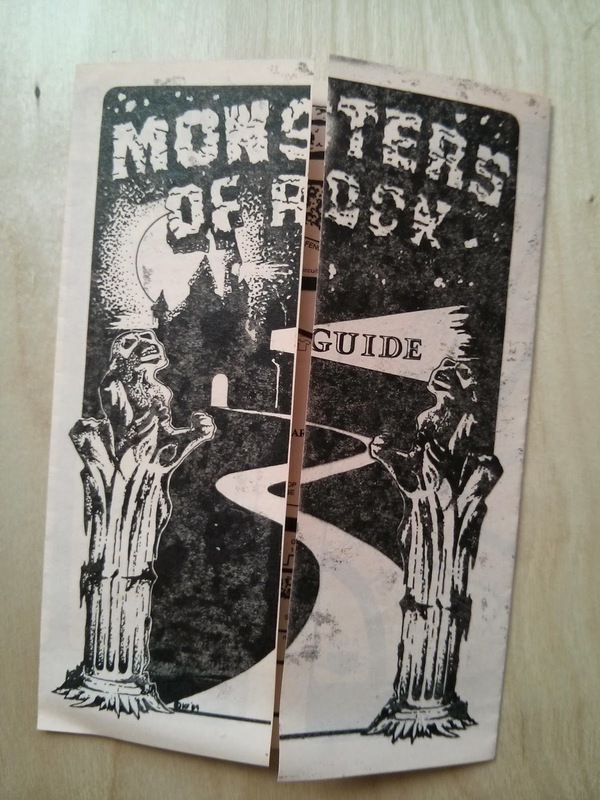 The person that reads your map should leave with a deeper understanding of the theme or topic. They shouldn't have to work too hard to gain that understanding either. The ability of the map-maker to make you care enough to want to look at the map and give you some sort of clarity about a topic is what good cartography is about. Does the story of the map immediately jump out at you? Given we cannot rely on people spending that much time or effort viewing your map, making the message legible is crucial and this has a lot to do with your ability to structure your map. This is down to what British geographer William Balchin termed graphicacy. He coined the phrase in a 1972 address to the Geographical Association. Graphicacy is the natural counterpart to other cognitive intelligent processes of communication such as literacy, numeracy and articulacy. Maps and other spatial documents are the tools of graphicacy and the very basis of geography. Cartography is the professional application of expertise in graphicacy. Becoming proficient in graphicacy will help you tell your story more effectively in the same way that effective writing or speaking skills helps you communicate using the written or spoken word. If you know how to speak in a graphical language then you're half way to being able to communicate your message. This goes beyond knowing constructional techniques and mechanics for knowing how and when to use certain graph or map types though. It's just as much about how you organise them on the page or screen. While written and spoken language comes at us in serial...one word after another in a sequence that our eyes follow and our brain systematically decodes, pictures arrive at our eyes in parallel. Maps are presented all at once. So we need to encode them so that certain components appear more prominently to give our brains a chance at decoding into some sense of order. These lead the eye. they may be larger or more visually prominent, they may use lighter or desaturated or bolder or more saturated colour, they may appear in a certain animated sequence or they may require interaction but doing a squint test is a good way to determine whether what you are looking at is communicating well. 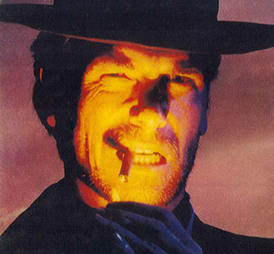 So...sit back as if you're in a wild west film, chewing on a cheroot and pretending to be Clint Eastwood. then squint and look at the map. What do you see? If you can still make out the main features and the central topic of the map then chances are it's got its graphical structure well proportioned and balanced. It's a simple way of seeing whether what you are seeing is what your brain is receiving. If your eyes are picking out peripheral or less important components under this test then that's going to cloud the message. There is some science behind this...what you're doing when squinting is reducing the amount of light entering your eye. Your peripheral vision is also impacted. You therefore have lower levels of visual acuity (visual resolution) and so you are trying your hardest to pick out key shapes and features. As with everything, there will always be examples that break the rules. there will always be innovation that overrides some of this so be mindful of that when looking at maps. Also, remember that the value of a map is going to vary between audiences so that will undoubtedly affect your impression. Then there's the final matter of subjectivity. While the above are semi-objective tests there's no doubt that we all have preferences for certain types of maps and particular looks and feel. Do you prefer Monet, Turner or Banksy? We all bring our subjective preferences to the table. "I like design to be semantically correct, syntactically consistent, and pragmatically understandable. I like it to be visually powerful, intellectually elegant, and above all timeless." "I thought that it might be useful to pass some of my professional knowledge around, with the hope of improving [young designers'] design skills. Creativity needs the support of knowledge to be able to perform at its best." "If you do it right, it will last forever." "The life of a designer is a life of fight against the ugliness." "There is no design without discipline. There is no discipline without intelligence." "...and that is why I love Design." The three tests outlined here are basic things you can do to see if your own designs are working and to look at whether other designs are working. It's not rocket science but it may just help you to take a step back and reflect on the quality of the work. There's lots of fancy ways to make maps but fundamentally...are they working?